15 polyethylene bags from one small grocery shopping trip. Lots of double bagging. Those same groceries fit into 3 great Baggu reusable bags. Greg Halinda Photography. It makes sense to stop using single-use bags. But it's hard to change the habit. The best way to make the switch is to truly love your bags. 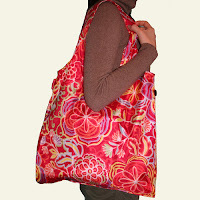 Good reusable bags need to be washable, durable, and ethically made (workers have a safe environment and are paid well - Fair Trade). 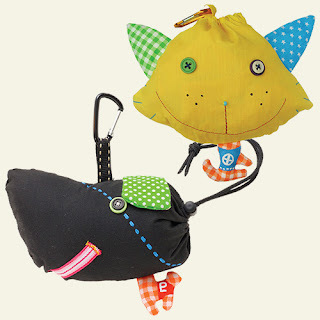 Here are some great bags, mostly made by ordinary people who decided to do something about the disposable bag problem. They each created their own version of the perfect bag, coming up with their own perfect materials, designs, and colours. Polyester, recycled cotton, organic help, upcycled ad banners - the variety is fun and exciting. Go to www.reuseit.com for a the best selection. 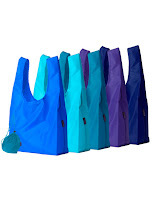 Baggu Amazing grocery shopping bags, 5 in a small pouch. Huge, durable, washable. Freak-o-bags The cutest monster bags, clip on, stuff in. Use bags that can be washed to keep your food safe. Freak-o-Bags. Cotton and nylon. Fair Trade.